Halloween is half a year away, but there are devilish doings in the Valley, foreshadowed by witchery in Lenox. A one-woman show at Amherst College this weekend puts a clown face on a 17th-century tale of demonic possession, and last month Shakespeare & Company gave a pre-season warm-up performance of Macbeth. Seven Devils and a French Nun riffs on the true story of the convent of Ursuline nuns in Loudon, France, that was gripped by a spasm of religious hysteria in the 1630s led by their mother superior, Jeanne des Anges. Sexually obsessed with the handsome (and randy) Father Grandier, and apparently driven by shame and lust, Sister Jeanne claimed he had seduced her in the guise of an angel. She was soon joined by other nuns who testified to lascivious visions and satanic couplings. The town was treated to the spectacle of public exorcisms, salacious testimonials, a phantom pregnancy (Sister Jeanne’s) and ultimately to Grandier’s death by fire. Aldous Huxley retold the story in his 1952 “nonfiction novel” The Devils of Loudon, which served as the basis for a play by John Whiting and a lurid film by Ken Russell starring Oliver Reed and Vanessa Redgrave. All three treatments focused on Grandier and ended with his burning at the stake, but Sister Jeanne’s story didn’t stop there. She went on to write her autobiography and “became very famous, like a rock star, worshipped almost as a saint, and purportedly performed miracles,” according to Amherst College theater professor Ron Bashford. 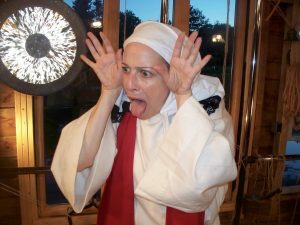 He’s the co-creator and director of Seven Devils and a French Nun, which presents the nun’s side of the story, performed by French-American actor and bouffon clown Carine Montbertrand. The two were drawn to Sister Jeanne “because her story was so peculiar and extreme,” and to the notion of portraying it as a clown show. May 6 and 7 at 8 p.m., May 8 at 2 p.m., Webster Hall Studio 3, Amherst College. Free admission, but seating is extremely limited and reservations are highly recommended. (413) 542-2277. The three witches who promise power and invincibility to Macbeth literally ooze through the walls of the unit set in Shakespeare & Company’s traveling production. Macbeth is half the repertory in this year’s Northeast Regional Tour of high schools, and those three specters represent half the multitasking cast of Jonathan Croy’s fast-moving, accessible renditions. On the 23rd of last month, the troupe gave a special performance on the company’s Lenox stage as a tribute to the 400th anniversary of Shakespeare’s death and an advance curtain-raiser for the summer season. In July and August, these six young professionals will perform the other half of the touring repertory, Twelfth Night, on an outdoor stage that harkens back to S&Co’s open-air beginnings. The shows likewise derive from the company’s Bare Bard tradition — nimble, quick-change versions in which the actors, like Shakespeare’s own ensemble, take on several roles, exiting as one character to quickly reappear as someone else. 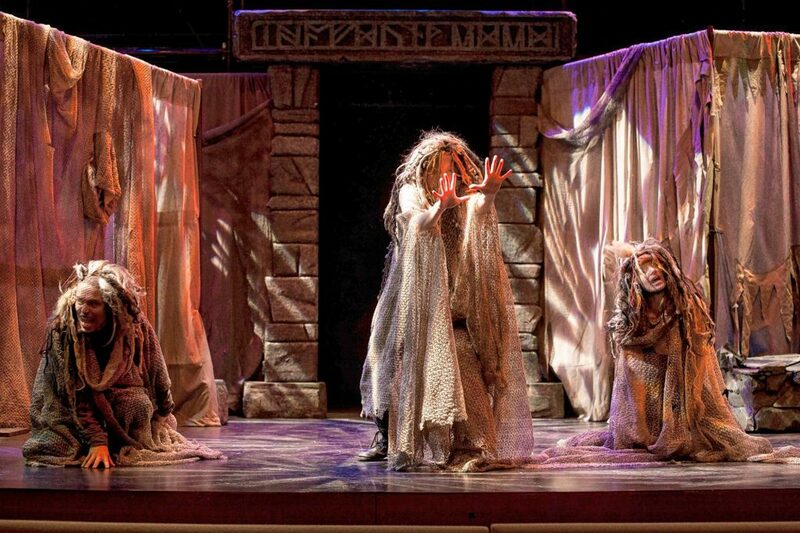 In Macbeth, the six performers handle 20 roles — Valley native Kaileela Hobby, for instance, briskly cycles through the murderous Lady Mac, the noble thane Ross and one of the witches. The performance, lively and dynamic, with humor and audience interaction engagement leavening the horror, was a potent showcase for these impressive young talents.